What is the medial collateral ligament (MCL)? What are the different types of medial collateral ligament (MCL) injuries? What are causes and risk factors of medial collateral ligament (MCL) injuries? What are medial collateral ligament (MCL) injury symptoms and signs? What tests diagnose and assess medial collateral ligament (MCL) injuries? What is the treatment for a medial collateral ligament (MCL) injury? Is surgery required for medial collateral ligament (MCL) injuries? Are there any home remedies for MCL injuries? What are possible complications of medial collateral ligament (MCL) injuries? What is the prognosis of a medial collateral ligament (MCL) injury? What is the recovery time for an MCL injury? Is it possible to prevent a medial collateral ligament (MCL) injury? The medial collateral ligament is one of four ligaments that help stabilize the knee. Medical professionals refer to knee injuries that involve the MCL injuries as sprains or tears. A direct blow to the knee or a noncontact injury due to cutting or sudden deceleration or stopping may damage the MCL. The medical meniscus and anterior and posterior cruciate ligaments are structures in the knee that are also commonly injured. Doctors make a diagnosis of medial collateral ligament injury with the aid of the patient's history and physical examination. It may be necessary to perform X-rays and an MRI. Treatment is often non-surgical. Physical therapy can help patients to return range of motion of the knee joint and to increase the strength of the muscles that surround and protect the knee. The knee joint allows the lower leg to flex (bend) or straighten (extend). To make certain that those are the only two motions that occur, there are four ligaments in the knee that help control and protect it. The medial collateral ligament (MCL) is located on the medial aspect of the knee (medial = the closest to the center of the body) or inside of the knee. The lateral collateral ligament (LCL) is located on the lateral aspect of the knee (lateral = away from the center of the body) or outside of the knee. The anterior cruciate ligament (ACL) and posterior cruciate ligament (PCL) prevent anterior (frontward) and posterior (backward) movement of the knee joint. Ligaments are tough bands of tissue that span a joint and attach to the bones on each side of it. The MCL is located on the inside of the knee (medial aspect) and is attached to the femur (thighbone) and tibia (shinbone). The MCL holds the knee stable when a valgus stress is placed on the outer part of the leg that could potentially buckle the knee toward the center of the body. The muscles that surround the knee, especially the quadriceps muscles located in the front of the thigh, and the hamstrings located in the back of the thigh, are also important stabilizers of the knee joint. During physical therapy for rehabilitation of a knee injury, the patient will be given specific exercises by the physical therapist in order to strengthen and stabilize the knee joint. These exercises include strengthening the front of the thigh (quadriceps), back of the thigh (hamstrings), calf, and hip. A sprain is an injury to a ligament. Like any other sprain, health care providers grade knee ligament injuries by their severity. A grade I sprain refers to when one stretches but does not tear the fibers of the ligament. MCL tears are grade II sprains if the ligament fibers are partially torn. MCL tears are a grade III sprain when the ligament is completely torn. Because of the anatomy and how the MCL is related to the medial meniscus (cartilage) and the ACL (anterior cruciate ligament), these two structures may also be damaged in association with an MCL injury. 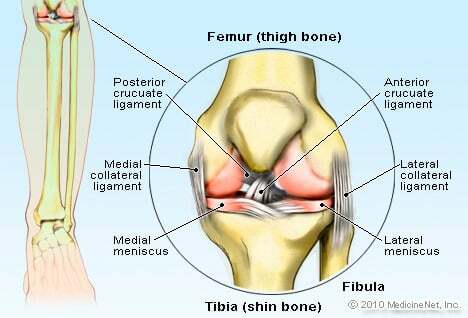 Medial collateral ligament injuries are the most common ligament sprains of the knee. They are also one of the common sports injuries and can occur in any age group. The most common risks include contact sports, including football, hockey, wrestling, and martial arts. Males tend to be more at risk than females. MCL injuries occur usually from a sudden impact to the outer part of knee. The injury may be either due to contact, a blow to the outside part of the knee, or noncontact due to twisting, cutting, or stopping suddenly (deceleration). Pain is the first symptom of an MCL knee injury. It typically occurs almost immediately and is located along the course of the ligament. Sometimes this is associated with swelling within the knee joint. Occasionally, swelling develops in a matter of minutes. The knee pain of an MCL knee injury may also cause the person to limp in order to protect the knee joint. The diagnosis of an MCL sprain is usually made by history and physical examination. The patient often knows the mechanism of the knee injury, that is precisely what they were doing and what position their body was in when the injury occurred. This helps the health-care professional understand the stresses that were put on the knee joint. Other questions might include whether the patient was able to walk, whether the knee began to swell, and how long it took for that to happen after the injury. The physical examination includes looking at the knee to see whether or not it is swollen and touching the knee in various places to find places of tenderness and pain. With MCL sprains, there is tenderness along the course of the ligament on the inner aspect of the knee. The ligament can also be stressed on physical examination to determine whether the knee ligament is stable or whether there is joint laxity. By pushing on the outer side of the knee (reproducing the valgus stress that often causes the knee injury), the examiner can determine if the MCL is stable or unstable. This can be a rough assessment of the grade of sprain, where a grade I sprain is stable and a grade III sprain is unstable. Physical examination concentrates on the knee joint and the hip and ankle to identify any other associated injuries. There are other causes of inner (posteromedial and medial) knee pain. One cause is inflammation of the anserinus bursa, where some of the hamstring muscles attach near the medial collateral ligament in the tibia. This bursa is one of the nearby the medial collateral ligament that may be inflamed and cause acute or chronic pain that can mimic an MCL injury. Plain X-rays of the knee can identify fractures of the femur and tibia bones. An MRI is the best way to actually visualize the MCL and determine the grade of sprain, but it is not always necessary. If there is concern that there is also a tear of the medial meniscus or anterior cruciate ligament, an MRI may be appropriate. If there has been chronic pain and inflammation, calcification along the insertion of the MCL into the femur can occur. This is referred to as a Pellegrini-Stieda lesion and usually causes no symptoms (asymptomatic). Less commonly, there can be associated pain and decreased knee range of motion that will require treatment. MCL sprains tend to heal with rest and physical therapy to help return range of motion and strengthen the muscles that surround and protect the knee. While sports is a high-risk activity, may people injure their knees in their daily work and home routines. Primary care providers, orthopedic surgeons and sports medicine providers routinely assess and treat these patients. Physical therapists are often an important part of the treatment team. Grade I and II sprains tend to heal within one to two weeks. The initial treatment often includes wearing a knee sleeve or hinged knee brace for comfort and protection and to increase range of motion and activity as tolerated. Patients will usually need crutches for a few days. Health care providers usually treat grade III sprains similarly but forgo a knee sleeve for a hinged brace. Some health care professionals suggest immediate range of motion while others like to wait a few weeks before allowing the knee to move. Patients may return to play or work in six to eight weeks. Historically, grade III MCL sprains were candidates for surgery, but more recently, doctors only consider surgery in patients where conservative (nonsurgical) treatment has failed. Surgery is a primary treatment in patients who have also damaged their medial meniscus and/or their anterior cruciate ligament. The initial treatment for an MCL sprain is the same as other sprains, including rest, ice, compression, and elevation. Because of the associated pain, using crutches to assist with walking is appropriate. Anti-inflammatory medications like ibuprofen (Motrin, Advil) or naproxen (Aleve) may be helpful for pain control. While these are over-the-counter medications, there may be reasons when this class of medications may not appropriate for a specific patient. It is wise to check with a health-care provider or pharmacist for any questions or concerns. Instability is the major complication of a grade III MCL sprain. While avoiding surgery and undergoing physical therapy is the mainstay of treatment, there are some patients where the MCL remains unstable and the ligament loose and causes knee joint laxity. These patients often benefit from surgery to repair the MCL but only after initial nonsurgical therapy has failed. Most athletes with MCL injuries are able to return to play within a few weeks of injury. Those who have sustained grade I and II sprains can be competing within one to two weeks, while those with grade III sprains may need longer, about six to eight weeks to recover. It's not possible to prevent MCL sprains except by avoiding traumatic physical contact. They are the consequence of being active in a sport or because of an unexpected accident. In sports, there is controversy as to whether or not wearing a brace can help to protect the MCL. Miller, Seamon J. "Medial Collateral Ligament Injuries of the Knee." MRI-Arthroscopy Correlations. Ed. S. Brockmeier. New York: Springer, 2015. Roach, C.J., C.A. Haley, K.L. Cameron, M. Pallis, S.J. Svoboda, and B.D. Owens. "The Epidemiology of Medial Collateral Ligament Sprains in Young Athletes." Am J Sports Med 42.5 May 2014: 1103-1109. How long did it take for you to recover from your medial collateral ligament injury? What symptoms and signs did you experience with your MCL injury? What tests were used to diagnose your MCL injury? Your knees go through a lot in the course of a day, and sometimes they can run into trouble. Here are a few things you can do when knee pain hits.